Preston Park Museum & Grounds wanted to know more about the artist of the painting, 'Flora (after Titian)'. Another painting was inscribed ‘Michele Cortiazzi/Fece in Frienze/Nel Anno 1742’ and was acquired by a private collection in Pennsylvania. When it was sold at Freeman's Auction, Philadelphia, in a 2010 auction of Fine American and European paintings, the work was presented as ‘manner of Alessandro Varotari (1588–1641)', an Italian artist also known as 'Il Padovanino'. 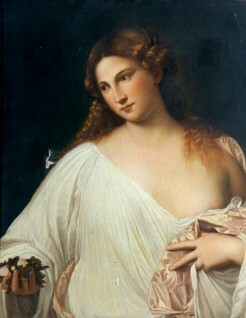 Varotari was known as a close follower of Titian. The same painting is recorded in the Fondazione Frederico Zeri, titled ‘Anonimo veneziano sec. VXII’. A label on the back of the painting gives the provenance: ‘Flora by Titian, painted by Cortazzi, brought from Rome by "Baulay (? )", April 1862'. An internet search revealed that Michele Cortazzi was an artist and copyist, born in 1800. The main participants in the discussion, Tim Williams, Oliver Perry, and Osmund Bullock, produced links to documentary evidence confirming that Michele Cortazzi was a well-known master copyist, who had a studio on the Via del Corso, Rome, which he shared with his son Oreste Cortazzi, and died there on 26th December 1865. There were name changes and false leads along the way, but finally Tim Llewellyn decided there was sufficient evidence to end the discussion and asserted that the painting is a copy of Titian’s Flora in the Uffizi Gallery, Florence, signed by Michele Cortazzi. The collection have now added the findings to their inventory record, and Art UK confirmed that the painting is now listed as the work of Michele Cortazzi, born before 1808, died 1865.